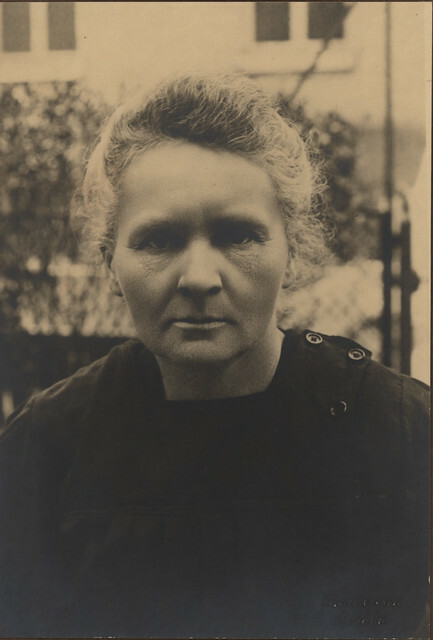 Portrait of Marie Curie (1867-1934), Physicist | Flickr - Photo Sharing! Collection: Scientific Identity: Portraits from the Dibner Library of the History of Science and Technology - As a supplement to the Dibner Library for the History of Science and Technology's collection of written works by scientists, engineers, natural philosophers, and inventors, the library also has a collection of thousands of portraits of these individuals. The portraits come in a variety of formats: drawings, woodcuts, engravings, paintings, and photographs, all collected by donor Bern Dibner. Presented here are a few photos from the collection, from the late 19th and early 20th century. junk_belly, hans s, MYLEReMOSS, and 118 other people added this photo to their favorites. She wasn't only French - she was Polish in the first place and as far as I know - has always used "Skłodowska-Curie" -> with her maiden name first. *brambly* - there were others, just check it. "As someone working in France and married to a Frenchman, I think she'd have known herself as Marie Curie. " i mean, there's not point to speculate if you can read the facts in history books and every encyclopaedia. it's even more obvious, than with Fryderyk Szopen. Maria, not Marie, and Skłodowska-Curie, not just Curie. She wasn't French - she was married to a fellow French scientist, Pierre. She was born in Warsaw where she lived for almost half of her life and moved to Paris with her sister to study. Yes, she became a french citizen, but till her last days she was also involved in polish scientific affairs (founding two institutes). Fine, I stand corrected. I have come to realise by now that not everything I learnt in school was the gospel truth. every country has their asylum seekers, immigrants and foreigners - we call them... "THEM". once they achieve something they immediately become "US". a bunch of hooded youths from marseille will be "THEM" (black, arabs etc.). MC Solaar is one of "US", french etc. jamaican runners became americans, because they won few gold medals and no white american can run that fast :-) i know it's a stereotype, but this is how it works. This image has been included in the Indicommons.org post Women across the Commons, prior to International Women's Day. Great picture, good, deep expression! A superb portrait in middle age of one of my heroes. Maria C. Skłodowska - Super Woman. Portrait..perfect. Maria Skłodowska was born in Warsaw, Poland! Hi, I'm an admin for a group called Historic Heroines, and we'd love to have this added to the group! can we lose the sepia? So he did! See my comment above!